U.S. Sens. Angus King and Susan Collins speak at a press conference at the Margaret Chase Smith Library in Skowhegan, May 16, 2014. 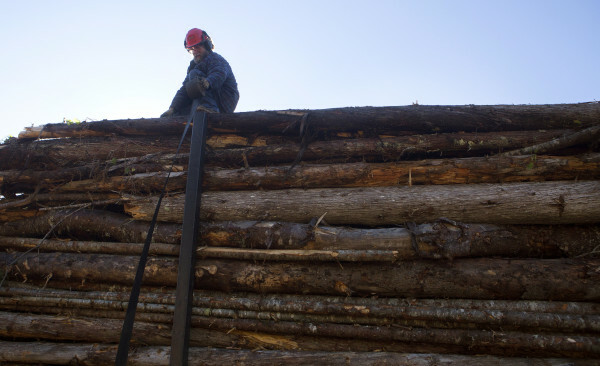 Tom Pelkey of Orland climbs on top of a load of logs to be delivered to Verso’s now-shuttered Bucksport mill, Oct. 9, 2014. Verso and owners of the mill in Madison have fought for tariffs on Canadian imports of supercalendered paper. PORTLAND, Maine — Three members of Maine’s congressional delegation testified before federal trade officials Thursday morning regarding increased tariffs on Canadian paper imports they’ve characterized as a double-edged sword for jobs in Maine. Sens. 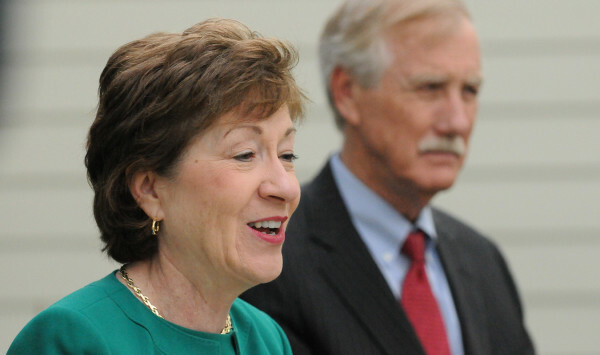 Susan Collins, Angus King and 2nd District Rep. Bruce Poliquin spoke during a hearing of the U.S. International Trade Commission, which is conducting a final review of tariffs on four Canadian paper makers. The tariffs stand to help the paper mill in Madison, the lawmakers testified, but could harm two Canadian paper producers that together employ about 1,200 people in Maine. “While I strongly support relief to these hard-working American men and women and the companies that are being injured as a result of illegal government assistance, I want to note that it is my belief that the Department of Commerce should have reviewed all four Canadian producers of supercalendered paper to ensure a fair and accountable process,” Collins wrote in a prepared statement. The statements Thursday echo the delegation’s concerns about the preliminary tariffs assessed during the summer. The investigation looked directly at government subsidies to supercalendered paper producers in Canada, focusing on the Port Hawkesbury mill in Nova Scotia and Montreal-based Resolute Forest Products. The continued tariff investigation last week raised the temporary tariff in effect, placing a 20.18 percent tariff on imports from Port Hawkesbury and a 17.87 percent tariff on imports from Resolute. Supercalendered producers Irving Paper Ltd. and Catalyst Paper received a tariff that averages the two other subsidies and that the delegation said during a phone call in May “does not accurately reflect these two companies’ actual receipt or non-receipt of government subsidies,” according to the June ITA memo. Poliquin said in a phone interview Thursday he thinks the tariffs on Port Hawkesbury level the playing field for Madison Paper, but he shared concern that tariffs on Irving and Catalyst are unfair. Irving is the state’s largest landowner and operates sawmills in Ashland and Dixfield. Catalyst operates the Rumford paper mill, which it purchased from NewPage last year. “This has got to be fair for everybody involved, but we do know this: that it was Madison Paper that has played by the international trade rules and they’re the ones that have been injured here,” Poliquin said, adding that he called for an expedited review of tariffs on Irving and Catalyst. Gov. Paul LePage echoed the delegation’s concern in a July memo to a White House economic adviser, expressing concern that the method of placing a tariff on Irving or Catalyst could harm some of the approximately 1,200 people the companies together employ in Maine. U.S. Customs and Border Control officials have started collecting tariffs on relevant imports, based on the preliminary tariff rulings. If those tariff rates are upheld in a final vote by the ITC, scheduled for Nov. 18, the money collected will go into the federal government’s general treasury. The tariffs that are not upheld will be returned to the companies.